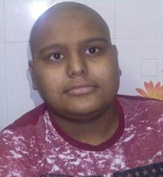 My Son Master.Ganesh , is sixteen years old boy and he is diagnosed with “ Pre-B Acute Lymphoblastic Leukemia” which is a type of Blood Cancer and has to undergo “Chemotherapy” and require supportive treatment on Cancer. I (Ganesh’s father) am working as a farmer and have no fixed employment or income and my wife is a house wife. I am the only earning member supporting the family. Me and my wife both are worried about our son’s critical illness and want our child to recover soon. We require your prayers and generous support for our son’s treatment and early recovery. 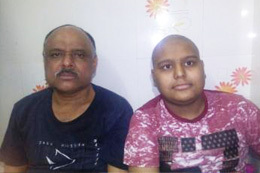 Master Ganesh Jadhav is a sixteen years old boy. This child is diagnosed with a “ Pre-B-Acute Lymphoblastic Leukemia” which is type of Blood cancer and has to undergo “Chemotherapy and other supportive treatment”. 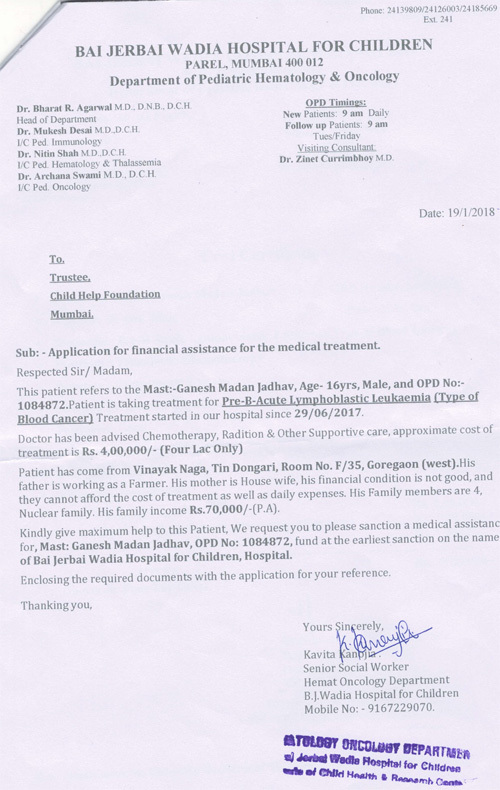 Currently Ganesh Jadhav is under treatment at Bai Jerbai Wadia Hospital for Children, Mumbai, Maharashtra. Mr.Madan Jadhav (Father of Madan Jadhav) is farmer and his mother is a house wife. He is the only earning member in the family consisting of 7 members and has no support from anywhere else and no other source of income. In such a critical situation it is difficult for him to bear the expense of his son’s treatment.